A growing body of research suggests that the “pristine” rain forest was actually carefully managed by indigenous people for hundreds of years. The settlement looked like little more than 11 mounds of earth surrounded by a sunken ditch. But if Jonas Gregório de Souza closed his eyes, he could imagine the Boa Vista site as it would have appeared 800 years ago. Perhaps, the archaeologist said, those mounds were houses circling a central square. Outside the defensive ditch, gardens and fruit trees might have flourished. The mile-long road leading to the enclosure may have had a ritual purpose, its surface hardened by countless ceremonial processions. Or maybe it linked the village to others, forming a chain of communities that crisscrossed the whole southern Amazon basin. There was a time when no archaeologist expected to discover such an elaborate settlement in this relatively resource-poor part of the rain forest. 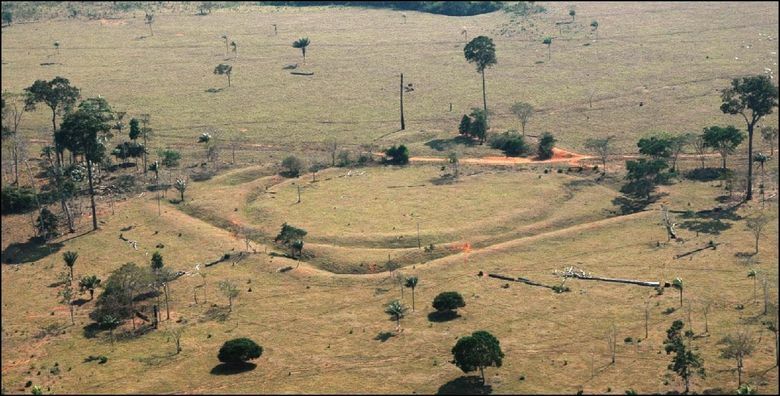 But in a paper published last month in the journal Nature Communications, de Souza and his colleagues describe the mound village and 80 other newly discovered archaeological sites from the years 1250 to 1500. They predict that the region hides hundreds more undiscovered sites, and that as many as a million people might have carefully managed the rain forest long before Europeans arrived. “It’s an important paper,” said Dolores Piperno, an archaeobotanist at the National Museum of Natural History who has worked extensively in the Amazon but was not involved in the new study. Though she wasn’t quite convinced by de Souza’s conclusions about the size of the region’s pre-Columbian population, the discoveries add to a growing body of evidence that large communities flourished in one of the world’s most diverse landscapes. Fifty years ago, she said, “prominent scholars thought that little of cultural significance had ever happened in a tropical forest. It was supposed to be too highly vegetated, too moist. And the corollary to those views was that people never cut down the forests, they were supposed to have been sort of ‘noble savages,’ “ she said. Collaborating with scientists from Britain and Brazil, de Souza, a research fellow at the University of Exeter in England, identified the new archaeological sites by looking at satellite images of the Upper Tapajós Basin, on Brazil’s border with Bolivia. This area is considered a “transitional zone,” where rainfall is more sparse and seasonal and the rain forest shifts into a savanna-like ecosystem. Since the basin is far from the floodplains that enrich other landscapes, researchers have long overlooked it, de Souza said, assuming that it couldn’t sustain large groups of people. But the aerial surveys revealed dozens of geoglyphs — geometric-shaped trenches carved into the earth. Though the sites range in shape and size — the smallest is just 30 meters across, the largest almost 400 meters — many were like Boa Vista, harboring villages inside or nearby. De Souza and his collaborators spent a month conducting on-the-ground surveys of 24 of those sites. All of them contained evidence that they had been inhabited: abandoned stone tools and broken ceramics, buried trash heaps, an enriched soil called terra preta (black dirt) that is characteristic of indigenous land management through burning and adding fertilizer. By measuring how much of samples’ radioactive carbon had decayed over the years, the researchers dated wood charcoal found at the sites to the early and mid-1400s. Since the 1970s, scientists have identified large, elaborate geoglyphs across other parts of the Amazon. Some have estimated there is about 60,000 square miles of terra preta in the basin. Others’ research shows that entire regions of the rain forest are dominated by tree species once cultivated for food by indigenous people. And highly planned networks of villages have been identified on either side of the region de Souza studied. The latest discovery, de Souza said, suggests there was a continuous string of settlements across the entire southern rim of the Amazon basin. “It seems that it was a mosaic of cultures,” he continued. The villages shared some practices — enriching the soil, cultivating brazil nut and cocoa trees, encircling their homes with protective ditches — but spoke a diverse array of languages. Plugging their findings into models that predict population densities, de Souza and his colleagues estimate that between 500,000 and a million people lived in this part of the Amazon, building between 1,000 and 1,500 enclosures. Piperno was skeptical that the region’s pre-Columbian population was really so large, and pointed to previous studies showing that fewer people were needed to construct these earthworks than was previously believed. De Souza agreed that there’s plenty more work to be done. He and his colleagues plan to excavate the Boa Vista site and to conduct surveys seeking more settlements. These discoveries don’t affect just our understanding of the past; they have implications for the future. Huge swaths of the Amazon are being lost to logging, clear-cutting for agriculture, wildfires, dams, mining and other forms of habitat degradation. The rain forest’s ability to act as “the lungs of the world” by inhaling carbon dioxide is declining. Though conservationists often speak of this region as having been a “pristine” landscape, studies by de Souza and others suggest that indigenous people influenced and enriched the rain forest for hundreds of years. If we want to preserve the Amazon, researchers say, we need to take those impacts into account.